I think I’ve dreamt about visiting a German Christmas market since I was in high school learning German and studying the country’s customs and cultures. Visions of stalls piled high with sweets and festive treats filled my head. The image of lights twinkling and decorated trees towering over snowy streets beckoned me from afar. Once we realized we’d still be in Europe for the holidays, I began my campaign to visit the German Christmas markets. I’m sure Matt got tired of me constantly reminding him that in December, come hell or high water, we had to go to the markets. Fortunately, he was a good sport about it and, as soon as we were able to figure out where we’d be the last month of the year, we began planning a Christmas market excursion. 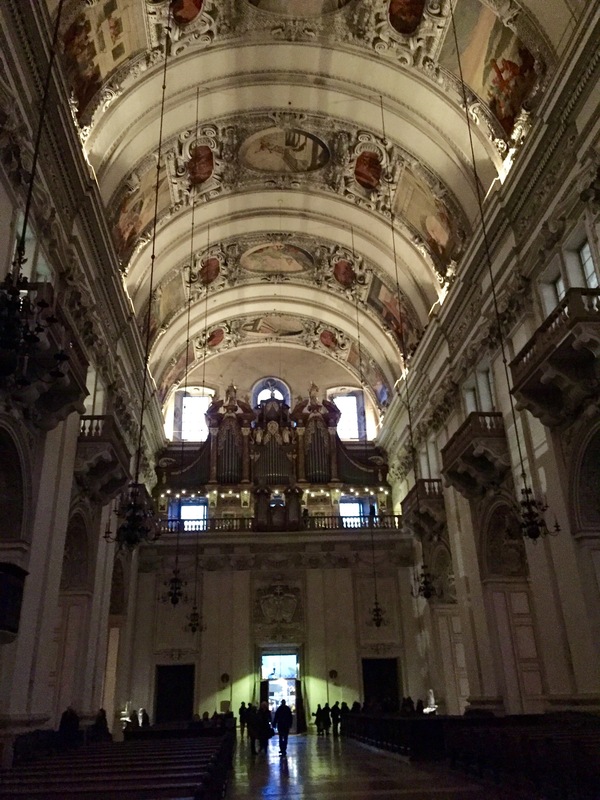 We landed on Munich after reading about how beautiful its annual market is and learning that it was just about an hour from Salzburg—so we could do both a German and Austrian Christmas market in one weekend! But wait, you say, that’s only two markets. You’re right, but I can’t leave out Toulouse. So here is my tale of three European Christmas markets. Starting in mid-November, we noticed that Christmas lights were being strung from buildings, streetlights and trees. It seems Toulouse doesn’t hold back when it comes to Christmas decorations! December 1, our wait to discover what the city would look like once the lights were turned on was over. After the sun set that evening, the city lit up in twinkly lights—from our location at the edge of the canal all the way to the Capitol in the center of town. The Christmas market is set up in front of the Capitol. Row after row of tightly packed stalls beckon visitors with brightly woven scarves, sweet little toys and local delicacies. The air is fragrant with the smells of grilled sausage, roasting vegetables and hot, spiced wine. We’ve been down to the market several times since it opened and have indulged in some of the mouthwatering dishes being served up steaming hot there. Mince pie–technically we ate this dish cold. Our favorite? Aligot. Aligot is a heavenly mix of potatoes, cheese, garlic and cream. Crème fraiche is beaten into mashed potatoes and cheese until they are creamy and can practically stretch to the sky when you pull out a bite with a fork. Sure, there’s probably about a thousand calories in a serving, but one bite and you really don’t care. With the music, the food, the lights and happy people milling around, the Toulouse market really does make it feel like Christmas. Salzburg, Austria is perhaps best known as the birthplace of Mozart and the filming location of the Sound of Music. It also has a beautiful and cozy Christmas market. Tucked near the Alps, the highest peaks of which are already covered in snow this time of year, the gorgeous old city boasts not just beautiful views, but incredible buildings as well. 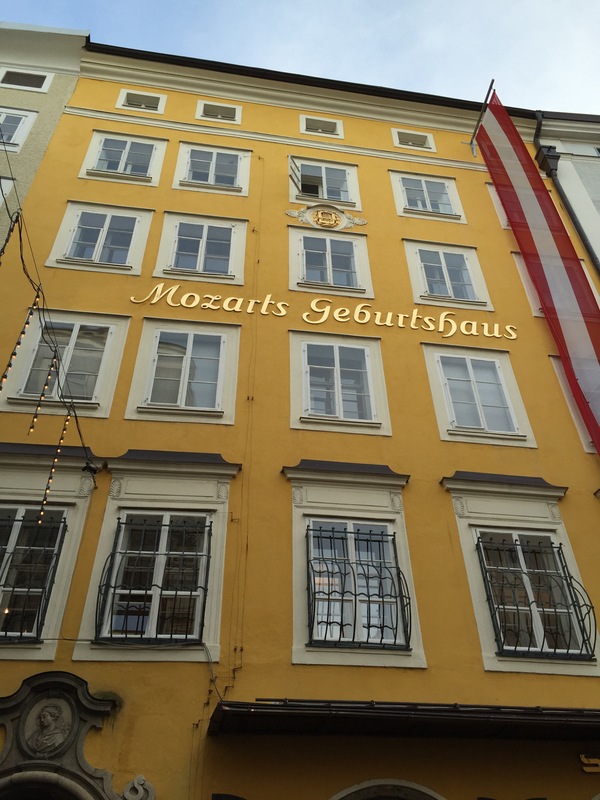 The house where Mozart was born. The Christmas market is in the old town (near the house in which Mozart was born). It stretches for several blocks near the Dom du Salzburg, a gorgeous and impressive cathedral that has been damaged (or burnt down) and rebuilt several times since 767. Inside the Dom du Salzburg. Gaily lit stalls offer all sorts of beautiful, handmade Christmas ornaments, tempting sweets and festive baked goods. Like the Toulouse Christmas market, there is plenty of good food filling the air with aromas that make your belly rumble. We enjoyed a fresh pretzel (I adore pretzels) and sausage, along with Glühwein and Kinderpunsch (the non-alcoholic “kid-friendly” Glühwein). We also picked up some Lebkuchen (German gingerbread) to enjoy later. The Salzburg Christmas market was the most romantic of those we’ve visited. All it needed was a little snow and it truly would have been a fairytale experience. Munich has more than one Christmas market. We ended up visiting three in one weekend—so technically this is a tale of five European Christmas markets. The first we went to is probably the most well-known. It fills up the blocks surrounding the Rathaus-Glockenspiel in Marienplatz. Once again, stalls are filled with every kind of Christmas decoration and treat you can imagine. This one gets extremely crowded, though, so be prepared to be patient if you visit. Here we enjoyed roasted chestnuts (yup—exactly like the song, except I don’t think they really cooked them on an open fire) and a Schokokuss (creamy marshmallow in a thin chocolate crust), as well as sauerkraut mixed with homemade potato noodles. We washed those down with Glühwein and Kinderpunsch. The second market we visited in Munich was the “Festive Middle Age Market” located at Wittelsbacherplatz. A fair number of men and women were wandering around this market dressed in middle age garb and a stage featured a performance from a magician of sorts (we watched him pull yards of rope from his throat and stick nails up his nose). The goods in the stalls here were more like what you would find at a medieval fair—princess crowns, leather goods, spices and more. The food here smelled incredible. We ended up getting a wild roast pig sandwich (which I didn’t really like, but Matt enjoyed). The third market we visited in Munich was at Tollwood—the same grounds where the annual Oktoberfest is celebrated. In addition to stalls, this market featured huge tents. In one there was a craft bazaar, in several others there were stands selling all kinds of international foods and in yet another there was a stage with a band performing. We enjoyed Ethiopian dishes for lunch and washed those down with apple fritters dusted with sugar. Yum! We soon had to head to the airport, but our hearts were filled with Christmas cheer and our bellies with way too much good food. It was an amazing weekend and the German and Austrian Christmas markets turned out to be everything I ever imagined–and more! Next Post 2016-The Year of the Baby! What a great time! Makes me want some hot wine!! !